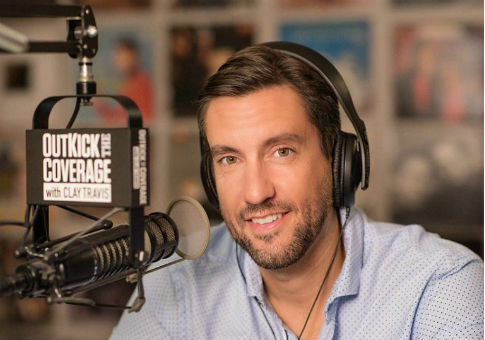 Politico Magazine ran a piece Friday accusing "Outkick the Coverage" owner and sports radio host Clay Travis of being, at the least, "associated" with the alt-right. "How Clay Travis rode the Trump wave from ordinary sports blogger to well-paid darling of the alt-right," read the subheading to a piece from sportswriter Ben Strauss. The piece states Travis has an "association to the alt-right," and contains numerous quotes from left-leaning critics who claim he's a member of the alt-right. "[Darth Vader] was more machine than man; Clay’s more Pepe the Frog than man now," said Deadspin founder Will Leitch. Strauss also quotes a Daily Beast article that refers to Travis as the "The Alex Jones of Sports." But neither the Politico piece nor the Daily Beast piece cite anything Travis has actually said or done that would qualify him as "alt-right." The positions they do cite – criticism of Colin Kaepernick and other kneeling NFL players, opposition to ESPN's liberal bent, etc.– are well within the conservative mainstream. Strauss notes that Travis is a lifelong Democrat who volunteered for the Al Gore campaign and voted for Barack Obama twice. He admits that when a caller to his radio show called Obama a Muslim, Travis corrected him and ended the call. "There was a space that opened up for Clay," Travis’ producer, Jason Martin, told me, adding that for a Tennessee conservative like him, none of ESPN’s most visible personalities—by which he meant people like Jemele Hill and Mina Kimes (both women of color)—seemed to speak to his political values. An ESPN staffer with whom I shared that critique told me, "Like ESPN doesn’t have a ton of white people on TV?" In an email to the Washington Free Beacon, Martin said he criticized a large number of liberal ESPN personalities–including white women and men–not only Kimes and Hill. He also said he told Strauss he liked the work of ESPN personality Sage Steele, a black woman. That fact was not included in Strauss' piece. "Race or gender was never mentioned once," Martin said. "It was about a lack of diversity of THOUGHT. I used it to frame a larger idea that what I enjoyed about Clay is that I’m allowed and even encouraged to disagree with him … which I do." "Everything Strauss asked was done to elicit a certain response. I was asked leading questions over and over about whether we made a concerted effort to appeal to the hard right, which I repeatedly said was not the case," he said. This entry was posted in Culture, Politics and tagged Clay Travis, Politico, Tennessee. Bookmark the permalink.